Choosing a microscope should be an enjoyable process. We created this article below to guide you through the process. We are happy to help you find the microscope for your needs, from beginners to professionals. Feel free to email at sales@bolioptics.com or call us at 909-930-3933 for additional assistance. The most important factor in choosing a microscope is your application: what do you want to look at? First, let’s talk about magnification. A light microscope has 2 sources of magnification. The primary source is the objective lens (the lens closest to the specimen). The secondary source is the eyepiece lens (the lens the viewer looks through). Total magnification is achieved when you multiply the magnification power of the objective lens by that of the eyepiece lens. 100X (objective) x 10X (standard eyepiece) = 1000X total magnification. While 1000X total magnification sounds impressive, most of the applications in microscopy applications only require magnifications levels of 60X or below. The two basic categories of microscopes are Compound (high power) and Stereo (low power). The most common use for compound microscopes is for biological purposes, for viewing smaller specimen such as the internal structures of cells, blood samples, bacteria, pond scum, water organisms, and more. These specimens require high powers of magnification in order to see their details. This is why compound microscopes are known as high power microscopes. The images produced on a compound microscope is usually reversed and upside-down. Because on objective is used at a time, the viewer sees a two-dimensional image of the specimen. There are 4 factors to help you determine this. 1. Magnification: Monocular microscopes work efficiently for up to 1000X total magnification. For higher magnification levels, you will need a binocular microscope. 2. Comfort: Binocular microscopes are more ergonomic and easier to use than monocular, because you can keep both eyes open for comfortable viewing. Monocular microscopes are more suitable for young children, as a basic introduction to microscopy. 3. Price: Monocular microscopes are usually the least expensive microscopes, then binocular, then trinocular. 4. Application: Most monocular microscopes include a simple stage and do not have a mechanical stage, which is useful for advanced applications. Most binocular microscopes include a mechanical stage. Trinocular microscopes are typically used for microphotography, where the camera attaches into the trinocular port, while the user can still look through the binocular eyepieces. Boli Optics offer a wide range of microscopes and microscope accessories to help you configure an instrument for any application for everyone, including beginners, students, educators, hobbyists, professionals, laboratories, factories, and more. 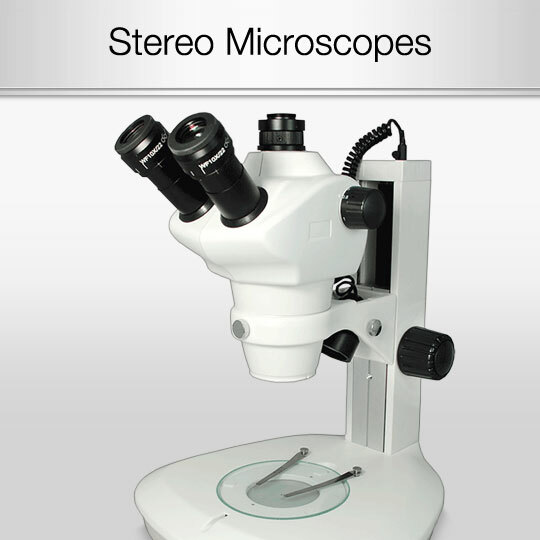 Stereo microscopes are fit for viewing larger specimen such as insects, bugs, leaves rocks, gems. They are useful for biologists to perform dissections, technicians to repair circuit boards, paleontologists to clean and examine fossils, and for anyone who require magnified vision in working with small objects. These specimen require lower power (6.5X - 45X), which is why stereo microscopes are known as low power microscopes. Stereo microscopes give viewers an erect (upright and un-reversed) stereoscopic 3-dimensional image. Most stereo microscopes are used for magnifications from 5X – 90X, and with our additional optional accessories, magnifications of 180X can be achieved. Stereo microscopes come in Dual Power or Zoom. Dual Power offers two magnification options, for example 20X or 40X. Zoom microscopes offer a continuous zoom range, for example from 6.5X to 45X. Stereo microscopes also come in a trinocular configuration for microphotography. Stereo microscopes are modular, meaning they can be attached to different stands. Boli Optics offers a wide range of parts, stands, and accessories so you can customize your stereo microscope for your specific application and needs. For industrial or advanced applications, we also offer a wide variety of products designed specifically for research, medical, forensic, inspection such as PCB, engraving, and repairing uses. When choosing a microscope, quality is one of the most important factors. Purchasing a microscope is making an investment in a piece of equipment to service your needs. It is our mission at Boli Optics to aid in the advancement of science and research, by offering the highest quality products and tools for our customers. We believe that microscopes should be available and affordable to everyone. We offer microscopes of superior quality (sturdy metal construction and professional grade optical glass lenses) at the best prices online for our customers. We design, manufacture, and sell our own product line of Boli Optics microscopes and parts/accessories, which are compatible with other microscope brands such as Zeiss, Olympus, Nikon, and more. We also double-check each package after the manufacturing process to ensure that our customers receive only the best products. The standard for high quality objective lenses is an achromatic lens. This means that the lens corrects for the fact that different colors refract through a curved glass at different angles. So, the microscope produces a significantly enhanced, or flatter image of the specimen through an achromatic lens. Achromatic lenses will satisfy most microscope users. Some advanced users will require an even higher quality than achromatic lenses, such as semi-plan or plan objectives. Plan objectives are also known as “perfect lenses,” which are usually needed for sophisticated biological research purposes (which are usually double the price of achromatic objectives). It is also important to ensure that objectives are DIN compatible. DIN is short for Deutsch Industrie Norm. Purchasing a DIN standard microscope is useful, as these objectives are interchangeable from one DIN compatible microscope to another. If the objective ever gets lost or damaged, you can buy a replacement for it from us, instead of buying a whole new microscope. Wider eyepieces mean easier viewing. WF (wide field) and SWF (super wide field) refers to the eyepieces. Higher power eyepieces will have smaller eye ports. 1. Halogen: Halogen lighting produces a strong white light, and usually includes a variable rheostat to adjust the intensity of light. 2. LED Light: LED lights are cool and give off no heat compared to traditional halogen lights. This makes LED lighting ideal for observing temperature sensitive specimen such as live samples. 3. Fluorescent Light: Fluorescent lighting is usually used for epi-fluorescent microscopes for more advanced biological research purposes. Fluorescent ring lights are typically used as an additional light source for stereo microscopes. Fluorescent ring lights are not the same as fluorescent microscopes. 4. 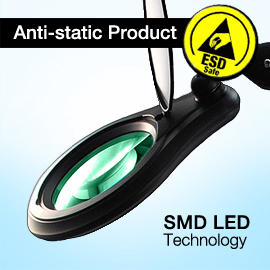 Tungsten: Tungsten lights are most popular for basic illumination for beginning users. 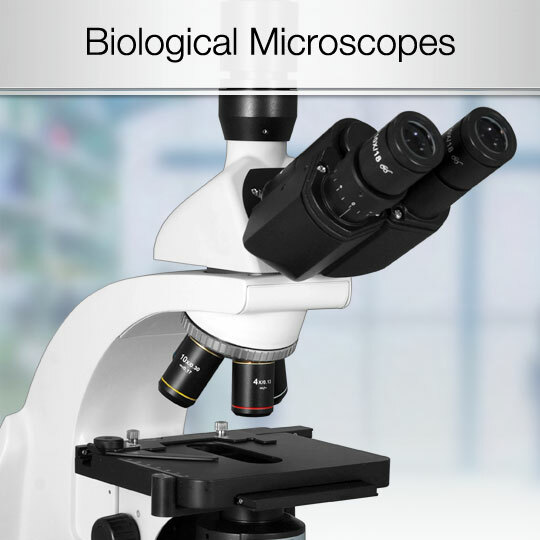 Boli Optics offers microscopes with all types of illumination mentioned above. Most Boli Optics compound microscopes include iris diaphragms and Abbe condensers as standard, which offers flexibility in controlling both the focus and quantity of light applied to the specimen. 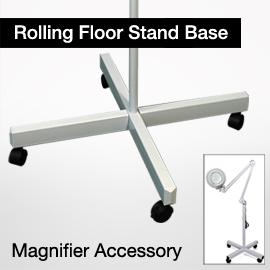 A mechanical stage is useful for compound microscopes, as it offers more measuring and handling functions. Boli Optics biological/compound microscopes come with a mechanical stage. We also offer a wide variety of additional stage parts such as mechanical slide holders for any additional requirements you may have. For many applications, it is important to have the ability to capture, record, and display images of the specimen. We offer a wide variety of microscope cameras specifically designed for microphotography and microvideography. We also offer camera adapters, couplers for DSLR cameras to directly attach your DSLR camera (such as Nikon, Canon, Sony, Olympus, Leica) for taking photos and videos. Don’t overlook the post-customer care after your purchase. We at Boli Optics offer excellent customer care and support to all of our customers. We also offer Free Ground Shipping within the Contiguous U.S. and have great warranties on our products. If you have any questions or need additional support in choosing a microscope for your needs, feel free to contact us via email: sales@bolioptics.com or phone 909-930-3933. Please let us know what your requirements are, and our technicians will make the best microscope recommendations for your needs. We offer high quality microscopes at the lowest prices online, and will offer to match any price online. If you find the same product online, in brand new condition, we will match the price. We offer Free Shipping to the contiguous USA. We offer a risk free, 30 day inspection period, with a money back guarantee (full refund). If you are unhappy with your product for any reason, please ship it back to us and we will gladly exchange or offer a refund for your purchase. Read our Exchanges and Returns policy here. We offer warranty on all of our microscopes, and some of our parts and accessories. Read our full warranty policy here. We hope this guide was helpful for you in determining what kind of microscope your application requires. If you’d like additional information on any of these topics, or would like help to choose the right microscope for your needs, feel free to contact us via email: sales@bolioptics.com or phone 909-930-3933, and we will be happy to help!